What is the PR Breakfast Club? All right, I’ll tell you. But we think you’re crazy to make us write an essay telling you who we think we are. What do you care? You see us as you want to see us – in the simplest terms, in the most convenient definitions. You see us as a brain, an athlete, a basket case, a princess and a criminal. Correct? That’s the way we saw each other at 7:00 on the morning of July 23, 2009. Get it? It’s like we’re all different but the same just like in the John Hughes movie, and also we talk around the time we’re having breakfast! So that’s the mytical lore behind that. But without people like @PRCog, @KeithTrivitt, @CTMichaels, and @pjdixon77 (who I’ll call the “early adopters”), the use of the hashtag wouldn’t have taken off like it did. 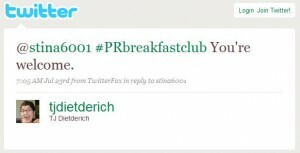 Now tons of people use #prbreakfastclub to talk about work, news, and lulz. I’ve met a lot of tweeps through #prbreakfastclub I wouldn’t have met otherwise. It’s open to anyone, of course. This is Twitter, after all. But everyone who participates is a PR flak in one capacity or another, and we all share a penchant for social media. And scooped-out bagels (and the mocking of them). Members of the #prbreakfastclub can’t really be defined beyond that. It’s a hashtag, it’s a conversation, it’s a group of flaks that are on Twitter, it’s a chance to vent, to catch up with friends near and far, and to start the day off right. Get it? It’s like we’re all different but the same just like in the John Hughes movie, and also we talk around the time we’re having breakfast! So that’s the mytical lore behind that. 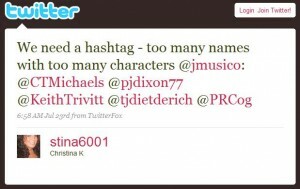 Now tons of people use #prbc (recently shortened from #prbreakfastclub) to talk about work, news, and lulz. I’ve met a lot of tweeps through #prbc I wouldn’t have met otherwise. It’s open to anyone, of course. This is Twitter, after all. But most everyone who participates at the moment is a PR flak in one capacity or another, and we all share a penchant for social media. And scooped-out bagels (and the mocking of them). Members of the PRBreakfastClub can’t really be defined beyond that. It’s a hashtag, it’s a conversation, it’s a group of flaks that are on Twitter, it’s a chance to vent, to catch up with friends near and far, and to start the day off right.